"Rushed? Need an elegant main dish to serve for an important occasion, that doesn't take a lot of preparation or time? This is it. This dish is not only easy and quick, it serves up beautifully as well. My family loves it. 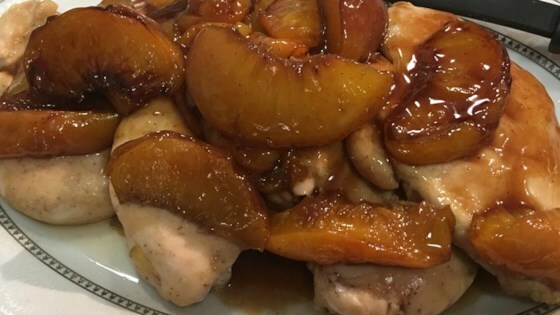 Tip: For a delicious sauce to serve over the chicken and peaches, mix 1/2 tablespoon cornstarch with 1/2 cup cold water and pour mixture into cooking juices. This mixture will thicken and become a sauce to pour over the chicken and peaches." Place chicken in the prepared baking dish, and sprinkle with 1/2 cup of brown sugar. Place peach slices over chicken, then sprinkle with remaining 1/2 cup brown sugar, ginger, cloves, and lemon juice. Bake for about 30 minutes in the preheated oven, basting often with juices, until chicken is cooked through and juices run clear. This recipe was awsome, everyone loved it, I used can peaches since they are out of season and it turned out great. This chicken was soooo good. Everyone in the house loved it, and said we should have it again. I used canned peaches in heavy syrup. It made a nice gravy that we poured over mashed potatoes!